Interpreting Scripture with the Great Tradition, by Craig A. Carter. Baker, 2018. Paperback, 304 pages, $17.98 (Amazon). Reviewed by OP pastor Matthew H. Patton. From the very first page of this exceptional book, Carter throws down the gauntlet to conservative Christian interpreters of the Bible: are you interpreting the Bible in an authentically Christian way, or have you unwittingly imbibed the assumptions of unbelieving biblical scholarship? Anyone weaned on the classic interpretive approach of evangelicalism (often called “grammatical-historical” exegesis because it emphasizes the grammar and historical setting of the human author of the text) and anyone who gets skittish when they hear the words “allegory” or “typology” needs to consider the argument of this book. Carter, a professor of theology at Tyndale University College (Toronto), served for several years as a Baptist pastor. He holds to the 1689 London Baptist Confession (a lightly modified version of our Westminster Confession). Carter’s book emerged from the crisis he faced of trying to preach Christ from all the Scriptures when the grammatical-historical approach forbade him from doing so. Simply put, can we read Old Testament (OT) texts as being about Christ when we often cannot demonstrate that the human author intended to point forward to him? Carter contends that we not only can but must read the entire OT as pointing forward to Christ. Two presuppositions govern his book. First, a high doctrine of Scripture: at the very outset the interpreter must decide whether to treat Scripture as a divinely inspired book, or as just another ancient text. Carter demonstrates that Scripture views itself as entirely divine, and is both flawless and unified. The second presupposition is what Carter calls “Christian Platonism.” The name may raise eyebrows, but Carter means by it the biblical insistence on spiritual realities like heaven and angels, as well as “the Creator-creature distinction”: the idea that God transcends his creation in every respect, and that even time is a created reality that is contained in God. Carter then surveys some of the great early church interpreters and concludes that they built an interpretive approach squarely on these two presuppositions, and that this approach must be recovered by the present-day church. To Carter’s thinking, the closest contemporary expression of the early church’s exegesis is found in “Vosian biblical theology”—that is, the approach of Geerhardus Vos, where “the Bible is interpreted as a unity centered on Jesus Christ by means of a hermeneutic that sees the most important context of every biblical text to be the canon of Scripture as a whole” (155–156). The final chapters point to how we can do this Christ-centered exegesis more faithfully, and these are the most exciting in the book. First, an OT text’s meaning includes foreshadowings of Christ that the human author may not have intended, but the Holy Spirit did. Typological connections to Christ are in the text when it is read in light of the whole canon. Christ is the great interpreter of his own Word, not only through his teaching, but also his work. These typological connections might go beyond the literal sense of the text, but they must be “consistent with, and grow out of, the literal sense of the text” (170). This rule safeguards against free associations that have no rooting in the text’s thrust. 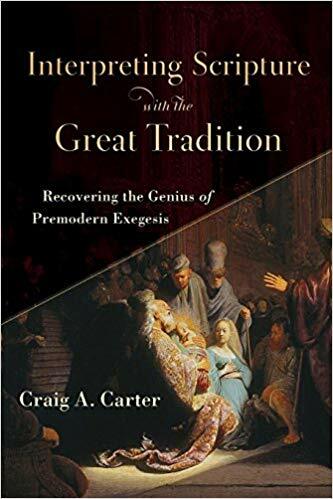 Carter then introduces “prosopological exegesis,” which focuses on Christ as the living speaker of the OT, a fruitful ancient approach that will be new to many readers. Ultimately, an interpreter needs Christian virtue: humility, faith, repentance, and a zeal for God. While Carter’s writing is sometimes unclear (his definitions of “Christian Platonism” and the “literal sense” vary), his book urges a rich, deeply Christian approach to interpretation, which must be recovered.